Are you looking to make a meaningful shift in your life? Here’s a simple but powerful practice that you’ll want to incorporate into your daily living! It’s Thanksgiving weekend and I have a lot to be grateful for. Today I went for a motorcycle ride with a couple of fellow riders and I was struck by the magnificence of my surroundings. The leaves were in full autumn colour. As I rode my senses were filled with the smell of leaves and from time to time fresh pine, along with the occasional smell of wood smoke from a stove warming a home somewhere off in the distance. When I ride in the fall it always stirs up memories of my dad. He left us a little over four years a go after a battle with cancer. He loved the outdoors. I remember him taking my sister on weekend camping expositions where we were young. Today as I rode, those memories danced through my head and in my heart. As I move through life it seems that it’s the simple things that I feel most thankful for…time spent with family and friends…a motorcycle ride in the country after a busy week…being able to laugh at myself over the silly things that used to up set me. These are some of the simple things that warm my heart and leave me feeling grateful. Experience has taught me that gratitude changes my response to life. There was a time when I was unaware of this. I saw things differently than I do today. I thought that my happiness was contingent on those around me. It wasn’t until I started practicing gratitude that I became aware that it was an inside job. When I’m grateful for what I have and what’s going on around me, my attitude changes. I get an “attitude of gratitude”. Life seems better and I’m happier. You might be wondering how to practice gratitude. It’s easy. Each day take time to think about what you’re grateful for. There are a few simple tools you can incorporate into your day, such as keeping a “gratitude journal” where each evening you record 5 things you were grateful for over the course of your day. If that’s not your thing, how about thinking about what you’re grateful for. For example, when you’re on your way to work, regardless of your mode of transportation, list off the things you are grateful for. Challenge yourself to come up with 25 things and then how about 50. Start with the little things that bring you pleasure, like a good cup of coffee, the warmth of the sun on your face or the comfortable shoes you have on your feet. I think you are likely getting the picture. The benefit of course is that while you are feeling grateful a shift happens. Whatever feelings you may have been experiencing disappear. You start feeling better about what’s going on around you. You’ll start experiencing an “attitude of grat.itude” and when you build the practice into your daily living a major shift occurs. Your life begins to change. 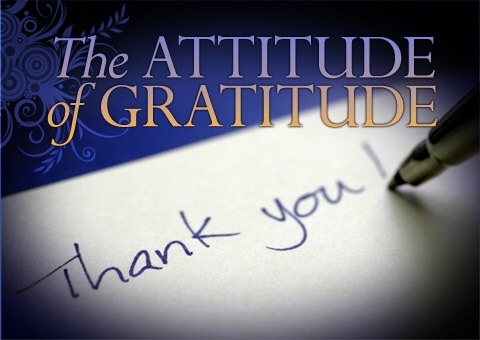 On this Thanksgiving weekend what can you do to springboard into an “attitude of gratitude”? Take the gratitude challenge and transform your life today!